It’s finally finished. And when I say finished, I mean the kitchen side of the peninsula only. In my mind, the other side is officially part of the breakfast room, so I’ll tackle that when I tackle the breakfast room. Remember what it looked like just after I installed the stock oak cabinets? The funny thing is that Wednesday night when I was installing all of the doors and drawer fronts and started installing a couple of the pulls, I was working late at night, and getting so frustrated. Things weren’t going smoothly, doors weren’t lining up like they should, getting the drawer fronts all lined up perfectly proved to be much more challenging that I had expected, etc. I actually started hating this peninsula and was so disappointed in how it was turning out. So I decided to call it quits for the night and go to bed. The next morning I got up, walked into the kitchen, saw it with fresh eyes, and just loved it. And then when I added the rest of the pulls, it just took it up another notch or two in my eyes. What an amazing difference cabinet hardware makes! It’s like the perfect jewelry for an outfit. My favorite thing about the peninsula is this section of drawers. It turned out just as I had envisioned. I’ve never had a kitchen with two different styles of drawers, and I’ve never used different types of pulls on the drawers in a kitchen before. But when I saw a picture on Houzz with a similar arrangement that had different styles of pulls for the different styles of drawers, it looked just perfect to me. So I decided to go for it. I’m so glad I did!! It’s my favorite thing! And I’m so glad I left the gold leaf off of the top drawers. I love the variation. It keeps things interesting. It’s been a long time in the making, but these cabinets are finally finished. But that doesn’t mean my kitchen is finished. After my cabinet doors, drawer fronts, and corbels got ruined in the rain, I was so frustrated and…well, depressed…that I literally just quit everything in the kitchen and moved on to other non-kitchen-related projects. I was so upset about it that I just really didn’t even want to step foot in the kitchen. I know, that sounds extreme and very silly. It sounds silly even to me. I’ve never reacted like that to a failed DIY project before, but then again, this is the biggest and longest project I’ve ever attempted. So seeing it so completely derailed like that after thinking I was just days away from the finish line really threw me into a funk. All of that to say that during the month that I was waiting for my replacement doors and drawers, I didn’t tackle much of anything else on my to do list. And I’ve still got quite a to do list filled with small finishing details. Previous Post My Breakfast Room - Shake Siding or Shiplap Siding? WOW! What an accomplishment! The kitchen looks awesome. I can’t wait to see the final reveal. It’s always the little things that take up the most time in getting a project completely finished but I know you can do it. Can’t wait to see what you tackle next. I ABSOLUTELY LOVE IT!!! Especially the different drawers and handles – it adds variety and interest without making it crazy with different colors/patterns. I cannot wait to see your whole completed kitchen! Your island is gorgeous! When you first chose your color I wasn’t sure about it. But, it looks amazing! I absolutely love it! Love the hardware you chose too! Can’t wait to see the whole finished kitchen! WOW! WOW! WOW! I don’t know what else to say so beautiful ,just stunning…and I am freakin jealous LOL Great job Kristi . It is beautiful! I am so glad you went with the hardwood floors as you did. I wasn’t really a big fan of the green, maybe because I’m too conservative when I think about doing things to my house…always thinking about blank slates for resale, but I really love the way this is coming together. It looks really beautiful. Whatcha go left on your list? Also, what are you doing with the baseboards? 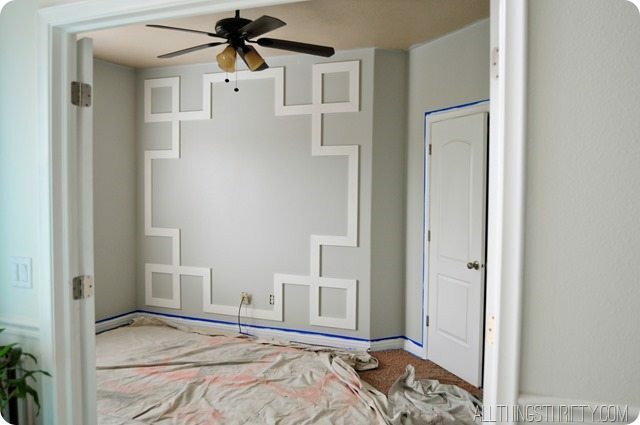 Will they be white or black like the door trim? BEAUTIFUL! I am so excited for the rest of the photos for the kitchen. My boyfriend and I have loved following you on this journey! So stinkin’ gorgeous – I love, Love, LOVE this! The road may have been seemingly long and at times a bit arduous but Girl, the pictures speak for themselves. Job well done and you should be so darned proud. I don’t want to beat a dead horse, but after seeing this picture, I’m more than convinced you should go with drywall in the breakfast room and allow the kitchen to shine. Besides the fact that for me shingle and lap are more rustic, I think either option would compete with the herringbone tile big time. Go drywall and let your table that you worked so hard on and chairs and a gorgeous light fixture be the shining moment that supplements the diamond that is the kitchen. If you still have your heart set on a lap treatment – what about that type of application for the ceiling? Looking forward to next week’s posts – can’t wait to see it styled all purty! Have a great weekend! I was thinking the same thing. You can see the ship lap peeking out from behind the peninsula in some of the shots, and it is quite a lot to mix in with the beautiful green, gold and herringbone tile. As you said yourself a couple of posts ago, not everything has to be the star. Why not put the ship lap or shakes somewhere else in the house if you want to use that treatment? The kitchen is beyond gorgeous. Love every.single.thing on the peninsula. Your choices are spot on. Yout talent and taste are incredible. Have a great weekend. It’s so beautiful. I love what you have created. I just had a flashback of what that kitchen used to look like. You have just added at least $20,000 in equity to your house in this room alone. You are one bright jewel. I tell ya…you are so talented….the kitchen is absolutely beautiful…now when are you coming to my house to do mine…?….:). I love what you are doing in your house! Especially that you are taking risks that realtors and other designers would shy away from. You have said a couple times that you never plan to move again. I want to feel like that, where I can do anything in my house because it’s mine, not potentially someone else. 🙂 Great work. I love your tenacity. You did an awesome job! Congratulations! 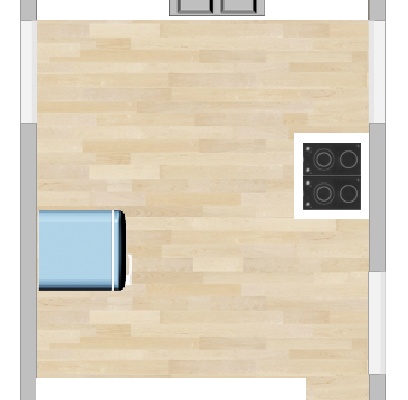 Ahem….May I remind you of those freaking awesome rolling doors in the music room? That certainly doesn’t count as doing nothing! It would have taken me a year or more to do those, before giving up and hiring someone. You did amazing things while your kitchen was on hold. What a beautiful and unique kitchen! You are one amazing and talented woman! I love that you share with us the ups and downs….anyone can make a mistake and you show us how that can happen. This is such a huge project (maybe the biggest you will encounter in your new home?) that being in a “funk” about your challenges is not at all silly. Anyone would feel this way and most would never start such a project, or at least quit when they encountered problems. But not you, Kristi, you are something else! Had you thought about doing a feature wall/ small section in shiplap herringbone pattern? I know how you like it, and it would tie into the kitchen Then, drywall the rest Just a way to get the best of both worlds!. Looking good girl!!!. Can’t wait to see the full reveal. I hope you have a little celebration when you are done this kitchen. :0) So glad you went to the natural floors. Great work! The drawers and cabinet doors look wonderful. I love lots of drawers in a kitchen. Looking forward to the big reveal. Soon, though, you’ll be out of excuses and need to cook one heck of a dinner for Matt, do you have a special dinner planned to celebrate? Beautiful! I love the different styles of drawers too. It looks SO GOOD. And I love love LOVE the peninsula against the floors. It kills me to say this, because I have a real dislike for all things PB and all their other companies, but I love the hardware. I am so glad you got it at a better price and did not have to wait more months for the other choice. I cannot imagine anything looking better. I do not think getting depressed over that epic “rain” fail is silly. Believe me, there will be a lot of things in your life that will depress you that may not be worth it…..but that I cannot even begin to think what I would have done (this is why I do not own a firearm). My second oldest son just said to me a few days ago when I was worrying about something that I needed to realize that I am a control freak and what I am worrying about, I have no control over. Of course he is right, but I am a worrier and like you said, one thing leads to another and you just want to pull the covers over your head and close off the world. Everyone feels that way sometime, it passes, as you have seen and ta da….the peninsula is done. Now all you have to do is finish up your tweeking and you will have a glorious kitchen in which to cook those healthy meals. Blessings. Kristi, you are so amazing and extremely talented…….WOW the peninsula looks SO gorgeous…..and I just love the hardware, it really is the jewel in the crown!! I have read all the comments over the shiplap and shaker and whilst I really love them both, I think having either of them on your breakfast wall, is too competing against your stunning kitchen and herringbone tiles. I think I would do drywall and make your furniture and window treatments the statement pieces to compliment your gorgeous kitchen. But in saying that, it’s your home and your have amazing vision for what you want to achieve and I have loved everything you have done and accomplished. You are such an inspiration!! Well done!!! So beautiful! I love the hardware and everything else! I think it’s perfectly normal to go into a ‘funk’ after the major disappointment of the rain ruining your drawer fronts and cabinet doors and corbels. I’d probably still be wailing. But, the silver lining in that dark cloud is that you got the drawer fronts that you wanted, the hardware is stunning, and everything is finally coming together. And then having the loss of a beloved pet to grieve is another bump in the road. You’ve been through some pretty hefty emotional ups and downs lately, so treat yourself gently. The peninsula looks beautiful. I too am looking forward to The Big Kitchen Reveal. I really didn’t think it would work to use two different types of hardware but looking at the finished project is AMAZING! 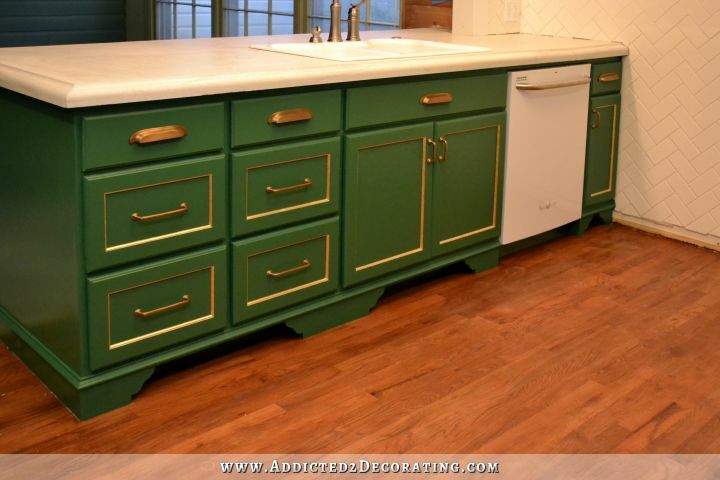 I love it and the gold accents on the drawers and doors are perfect. You wil really love it when you get everything moved back in and are able to work in there at mealtime. What an inviting place to cook and bake! Lovely, it beings to mind a high-end colorful “unobtainable” range. The color, embellishment and hardware are just perfect. You are really bring this minimalist around! That peninsula looks beautiful! 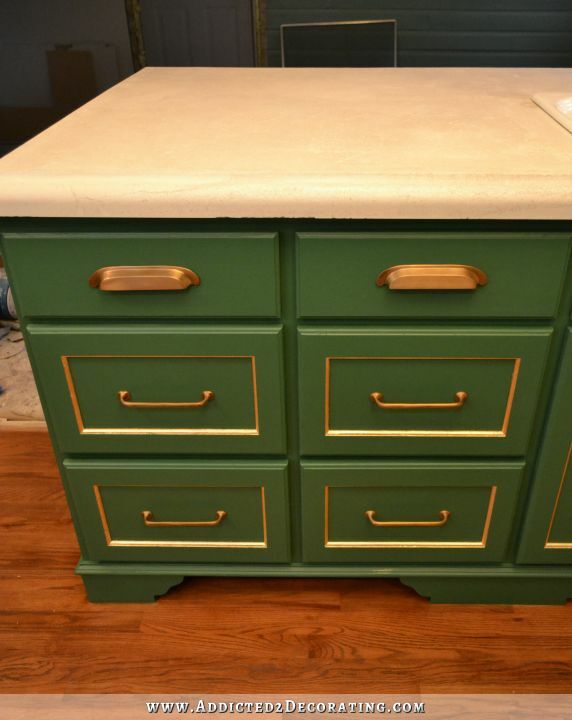 I love the different pulls and I agree with not putting the gold on the top drawers. Kristie, again, the peninsula looks amazing and I can’t wait to see the finish project. Ohmigosh! Perfection! And I just love that hardware. I’m in middle of kitchen remodel (mine’s taken much longer than yours) and I think I want that same hardware. Are those the 9″ pulls??? Just gorgeous, Kristi!! 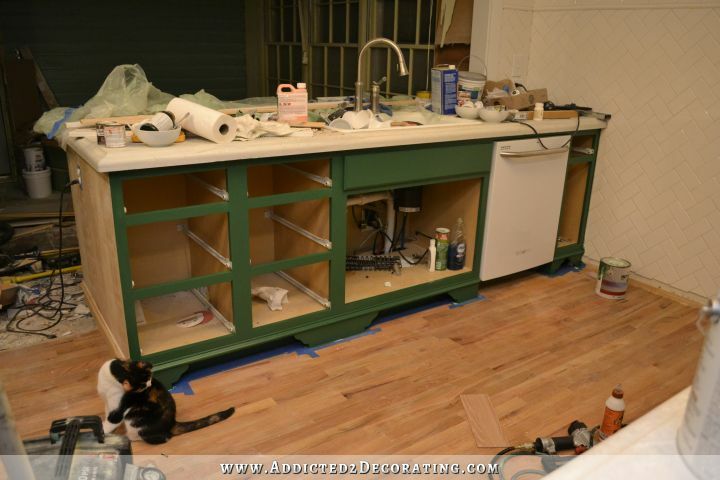 Cannot wait to see the photo shoot of the entire finished kitchen! What I love most is that you turned those ho-hum stock kitchen cabinets into stunning furniture. Just gorgeous!!! Wow, I didn’t think it would look so stunning! I’ not so much a fan of green and esp. the gold bits are not me at all, but all together the look is really fantastic and I would gladly have that as my kitchen now 🙂 Am I the only one who finds it looks a bit steampunk? For me, that only adds to the attraction! well done, congrats! I’m green with envy! As green as your cabinets. I never liked green much but, boy, have you managed to swing my opinion of it a full 180! Anybody that can work on this darned this for a month and a half should have no doubt about weight loss. You are amazingly persistent! I can’t believe the lengthy process: the gold-leafing, the rain-soaked drawer fronts, the cement counter-tops… all of it so time-consuming and fraught with unexpected problems. Kristi, you might be a good decorator, but you are an amazingly accomplished woman. Woot! The island is done! May you enjoy it and, please, beam with pride every time you look at it. 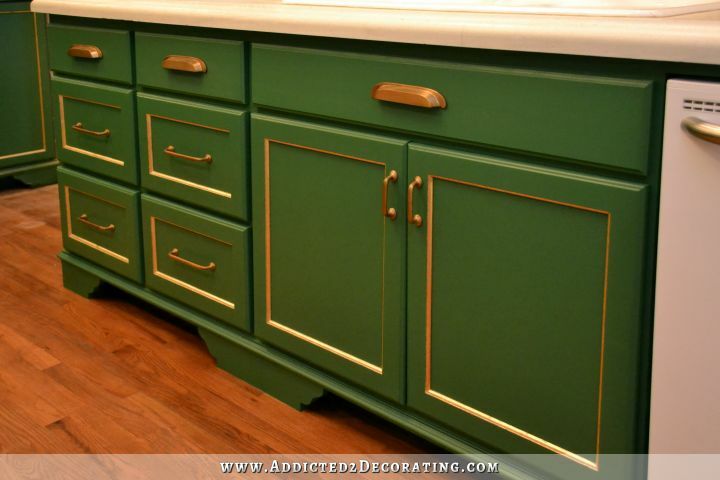 The hardware really gives your beautiful cabinets a vintage look. I love it even more! Kristi…you should be so very proud. Well done!!! Wow! Gorgeous! I LOVE what the jewelry does for the cupboards and the gold leaf just supports your choices. I love that you do what you want and like not just following the trends. It is great to see color used. Most rooms are all white or forms of white or gray. Personally, I can’t live without color. I look forward to seeing the final reveal! Awesome Kristi! Without a doubt this is the best kitchen remodel I have seen done a “one person” crew! What a marvelous treat for you and Matt! Oh, Kristi!!!! O so pretty!!!! Love it! Awesome! Awesome! Awesome! I love the entire look, including the hardwood floors!!! It all looks beautiful, Kristi. You should feel great about the island and everything else you have accomplished there! 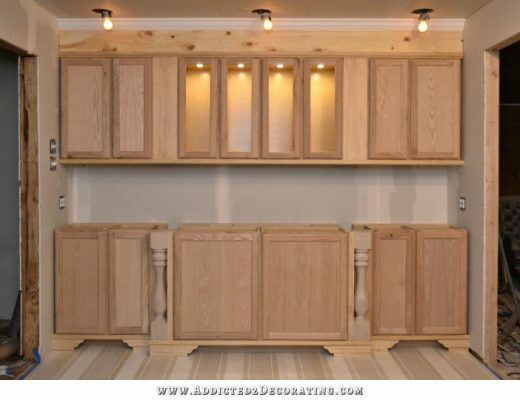 It is hard to believe what can be accomplished with stock cabinets, a vision and a LOT of time and effort. Your kitchen looks so custom and high-end. I love all of the pulls and how beautiful they look with the gold leaf. I just caught up with the last three days of posts and missed commenting on ship lap vs. shingles, so here is my two cents: I see shingles as the more casual looking of the two. However, I have to agree with a lot of other comments that both styles seem a little too country to be so close to such an elegant kitchen. 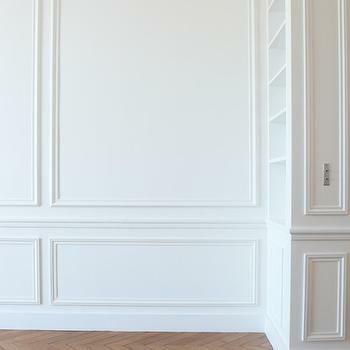 How about drywall (your favorite) with some beautiful molding? Look at you! Go girl! So amazing! You should be so so proud! Thank you for sharing your journey! Keep it up!!! Gorgeous, just gorgeous! I love every single thing about this peninsula. I can’t wait to see the full finished kitchen!!! i think this is the third or forth the i have been on there to look at this post today. I am in love with this kitchen. I was so unsure of the color and now I love it as well as the amazing hardware and gold leaf. Great job Kristi, just amazing! It is beautiful!!! And I just love looking at that gold leaf….I think it my favorite part of the whole kitchen, although it is hard choose. Cameron Diaz Called and boy is she pissed. She wants her kitchen back with all of your finer details!!! Perhaps you may want to use drywall in the breakfast room and use ship lap when you redo the family room. 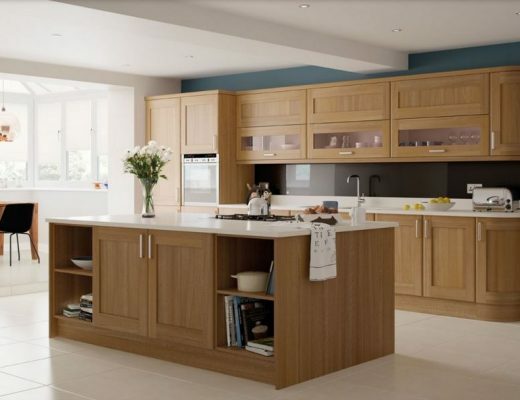 Since is is going to be rebuilt it could make quite a charming look without competing with your elegant kitchen. Just a thought. I love the drawers. They turned out beautifully. It looks amazing! 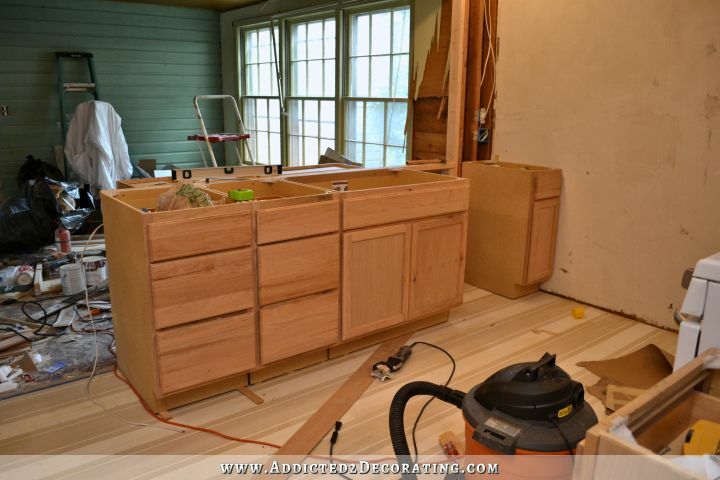 Few things are more stressful than remodeling, especially when you are the only one doing most of the work. I’d be ready to burn it all and walk away, you are far more patient than I am…my kitchen is still not finished and it’s a year I think after we started, I have to just let go of it sometimes…or it would drive me up the wall. well it’s looking great. You are doing an amazing job. Don’t give up as you are tackling one heck of a job. But it’s looking fantastic. Love the drawer and the different pulls suit the kitchen well. Love you work. it is SPECTACULAR! Better yet, the fact that its your favorite thing speaks volumes! You deserve a tranquil place after all that work, blood sweat and yeas,,,tears! It is an accomplishment that you should be extremely proud of! You did good kid! It looks beyond PROFESSIONAL! A job like this would have cost you THOUSANDS! But you took it on and finished it on you own on YOUR terms! So beautiful. I like the way the cabinets look like furniture. I would want to just stand there and stare! Wow!! That is BEYOND beautiful! I love the little drawers! It’s gorgeous! I like how your kitchen is turning out better than the celebrity’s kitchen you used for your “inspiration” photos–you have definitely improved the design with your warm hardwood floors, your backsplash and countertop choices, and some of your other details. It has such a “classic” look somehow–even though it isn’t what most of us probably think of as a classic kitchen. (I can easily imagine it in an English manor house kitchen from the 1940’s for some reason–though I know nothing of what English manor houses’ kitchens look like, other than from the movies! I mean that in the very best sense—it’s “classic,” “classy” and “traditional” yet contemporary–a tough look to achieve.) I love it. I am so glad it is turning out for you finally after your other cabinet-doors -in-the-rain disaster! Second, I have always been a diy’er, but in the past 3-5 years, I have really lost motivation. I live in a 160+ old victorian house and have numerous projects to get to. You, my dear, have set my heart soaring once more and I am on the move, finally, again! Thank you!!! Anxious to see what you will be tackling next. Question: Have you ever installed/applied manufactured stacked stone/stone veneer (like on top of an existing brick fireplace? I’m thinking of doing this in my den ’cause I hate looking at the white painted brick every day. I watched an episode of a show on HGTV yesterday where a workman did this and he looked like he was just “buttering” the back of each stone section with some kind of adhesive and then applying the piece directly to the brick, starting at the bottom of the fp. It was definitely painted brick and he definitely didn’t install any lathe over the brick before applying the veneer. Is it really just as easy as this? I’ve never used it, but I do think it’s that easy. Your kitchen looks amazing! You should be very proud of what you have accomplished, you have so much talent! Could you share what type of paint and gold leafing you used? Thanks! I used Benjamin Moore Advance paint, and topcoated with Rust-Oleum Polyurethane in a matte finish. I’m not sure of the brand of gold leaf, but I bought it at Michael’s, and it comes in a package of about 20 or 25 sheets of gold leaf for around $10.